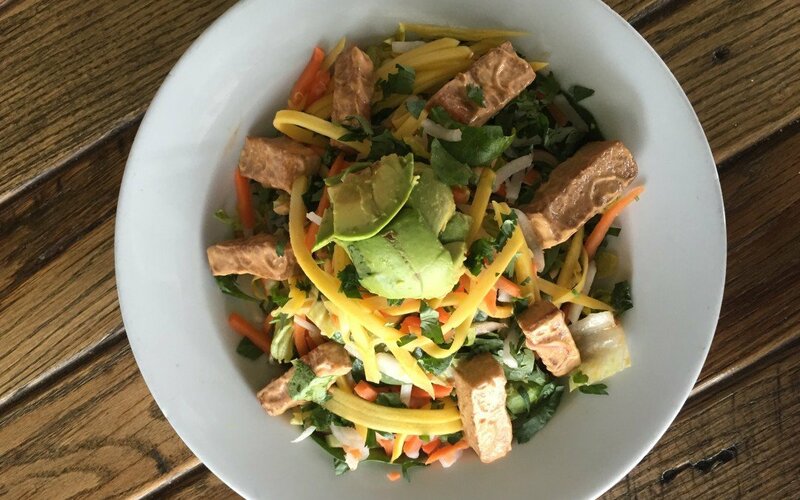 We’re so excited to introduce our latest Chef’s Pick, the Thai Spring Roll Salad. Think of it as an unrolled version of the popular traditional appetizer, only upgraded into a satisfying meal with all the flavors and textures you love in every bite: savory, spicy, sweet, creamy, crunchy, rich, and refreshing. Out of everything on our menu, this salad boasts the most ingredients, and each one adds a unique note to the overall harmony of flavor and texture that’s going on here. We’re very proud of our new baked, marinated organic tofu, which also replaces the tofu we use in our Vegan Banh Mi. It’s marinated with Bragg’s famous Liquid Aminos. A healthier version of soy sauce or tamari, Bragg’s is a non-GMO liquid protein concentrate, derived from soybeans. We’ve heard from a lot of folks who say they don’t typically eat (or like) tofu, but love our version. The fact that we also toss it in a rich and savory almond satay sauce really pushes it over the top. The mix of butter lettuce, romaine, napa cabbage, and Scarborough Farm’s baby spinach provide the perfect flavorful and nutrient-packed base, allowing each other ingredient to shine, from the sweetness and acidity of the fresh mango and house-pickled daikon and carrots to the crunch and richness of the toasted almond slivers and the avocado. If you’ve never tried kelp noodles, you’re in for a treat. They’re fat-free and only have a couple calories, but add an addictive texture and crunch while contributing a nutritional boost to your bowl. We top it all off with our Chef’s sweet and spicy vinaigrette made with rice wine vinegar, sweet chili sauce, brown sugar, garlic, lime juice, and ginger, which really makes the whole thing sing. Dig in! We’d love to hear what you think.